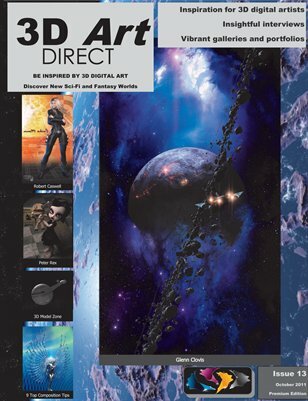 3D digital arts magazine, promoting selected artists and their portfolios through detailed interviews. This issue:- 9 Essential composition tips for your digital art. Interview with Glenn Clovis - master at creating digital nebulae; “One of the reasons I like painting nebulas so much is that it stems form pure chaos". Rob Caswell “Take ten photographers and tell them to photograph a subject and you’ll get ten unique results. The same goes for Poser artists.Each result is a reflection of the creator’s skill with the tools and creative manipulation of the subject". 3D Model Zone explores the Celestia Motherlode website. Peter Rex on the Reality Lux plugin for Daz Studio.